I bought my first Five String Violin from a seller on eBay back in 1998. I wanted something I could play on stage with my country band, Wild Heart, and bring with me to Egypt for a concert I was gearing up for in front of the Great Pyramids in Cairo. I did some online research and learned about a company called Straus that was based in Korea. They made a lot of other models including the one I liked (which was shaped like a treble clef). The factory also built mandolins for some top American brands including Fender (electric violins), Michael Kelly and Rigel (mandolins) and Saga (banjos, guitars, bouzoukis). 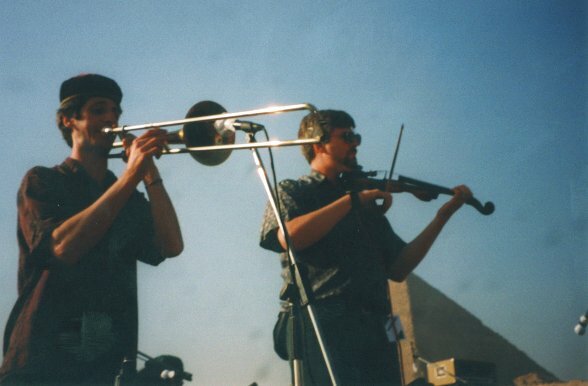 Here's a picture of me playing my Straus electric violin with my friend Brian Bender on the trombone. You can see the Great Pyramid of Giza in the back. We were literally dozens of feet in front of the Sphinx. While I still play a five string fiddle in my Celtic group, Celticado, I don't import them any more. They are capricious and difficult to keep in tune. The C (low) strings tend not to sound very good, even on the higher quality instruments, due to the short length of the neck. 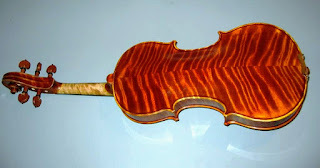 I can still get the TwoTree violins by special order for customers that are interested. I have a video here of me playing one. I apologize for the sound. It was recorded in my basement ten or eleven years ago.